Tempting France's eaters into the sin of Gluttony? A group of French chefs and intellectuals have sent a petition to the Pope, asking him to reclassify the deadly sin of gluttony. They argue that the French word for the sin - gourmandise - has changed its meaning over the years and is now used to denote a gourmet, someone who truly appreciates good food and wine, rather than a glutton. 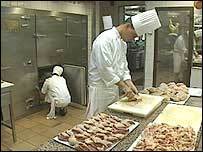 One of the group's founders is the well-known French chef Paul Bocuse, whose late friend - France's best-known baker, Lionel Poilane - first came up with the idea several years ago. Mr Bocuse and several others are carrying on the campaign in Poilane's memory, supported by gourmands across France who would like the Vatican to change the word to "gloutonnerie"', a term that suggests much greater greed than gourmandise. At Paul Bocuse's brightly-painted three Michelin stars restaurant in Lyon, food lovers come to worship at the altar of French cooking. But according to the Catholic Church, these people may be endangering their immortal souls by committing the fifth of the deadly or cardinal sins. 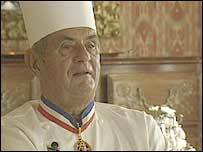 But Mr Bocuse and his group of connoisseurs argue that these days, gourmandise is a pleasure not a sin. "You know, being a gourmand is not a sin. Being a glutton is. "To be a gourmand is one of life's great pleasures. Gourmands don't just appreciate fine food and good wine, but they share it - and thus double the pleasure," Mr Bocuse smiles. The seven deadly sins were formalised in the 6th Century by Pope Gregory the Great. Yet today, French priests rarely take confessions of gourmandise. The parish priest at the Church of the Lamb of God in eastern Paris, Father Alain de la Morandais, believes that gourmands are in fact performing an act of worship or thanksgiving to God as they appreciate their food. 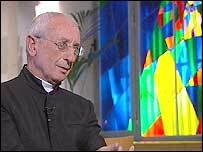 "I am a doctor of moral theology, and I think the only real sins are ones of excess. Addiction - for example to drink or to drugs or to cigarettes, that is a sin. "But these days," he tells me, "the French word gourmandise is understood to mean a gourmet - and a gourmet is someone who savours, who appreciates good food, good wine, and all the flavours that God created." Yet some fear there is little the Vatican can do in response to the petition from France. Experts say that if this is a semantic issue, rather than a theological question, then it is a matter for an even higher authority - that of the Academie francaise, the ferocious guardians of the French language. Colette Guillemard, food writer and author of the book The Origins of the Word Gourmand says the academy is probably the only body that can actually get the meaning of a word in French changed. "It's a question of language, more than a problem of sin in itself. But of course, it will be very hard to find the right person at the Academie francaise who can make that change." Although two of its members are on the group committee of the petitioners De la question gourmande, the rest of the academie is less convinced. "This question is a waste of time," the academie's press officer told the BBC. But judging by the letters in the French newspapers and frequent discussions of the issue, it is a question that interests many in France, whether for its sheer quirkiness or out of genuine theological worry. Either way, those French gourmands anxious to know whether they are sinning on a daily basis will just have to be patient - there has been no official reply from the Pope as yet.